We believe the importance of modern biological principles must transcend the university classroom and enable our students to contribute as global citizens. Undergraduate courses are taught mostly in the Dobo and Friday Halls. These facilities include state-of-the-art lecture halls, teaching laboratories, seminar rooms, and a computer lab. Many faculty members have their offices and research laboratories in these buildings as well. The Department of Biology and Marine Biology also has extensive facilities in the Center for Marine Science located a short distance from the campus. Facilities at the Center for Marine Science include a classroom, a large teaching laboratory, aquarium and collection rooms, and smaller laboratories for student research. In addition, some Biology and Marine Biology faculty members have their offices and laboratory space at CMS. The department maintains a 2250-square-foot greenhouse, a vertebrate range, and a herbarium. The Kresge Greenhouse provides facilities for faculty and student research projects and for laboratory exercises. The vertebrate range allows preparation and storage of vertebrate research and teaching collections. The herbarium is the repository for dried collections of algae, fungi, bryophytes and vascular plants. The function and activities of the herbarium include documentation of the vegetation of the regions in which the specimens are collected, serving as a source of teaching and research material and serving as a source of information to persons interested in the identification of plants. Classroom and laboratory instruction is supplemented by field trips to adjacent oceanic, estuarine and terrestrial natural laboratories, including the Bluthenthal Wildflower Preserve and the Ev-Henwood Nature Preserve. For answers to advising questions, please visit our advising webpage. You may also contact our Academic Advising Coordinator, Melanie Canfield. 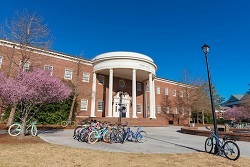 For questions or requests concerning any of the graduate programs in the Department of Biology and Marine Biology please e-mail the Graduate Administrative Associate, Lisa Noah, at noahl@uncw.edu. Also, please take a look at the Biology Graduate Student Association. Please send suggestions concerning the Biology and Marine Biology website to noahl@uncw.edu. Thank you!